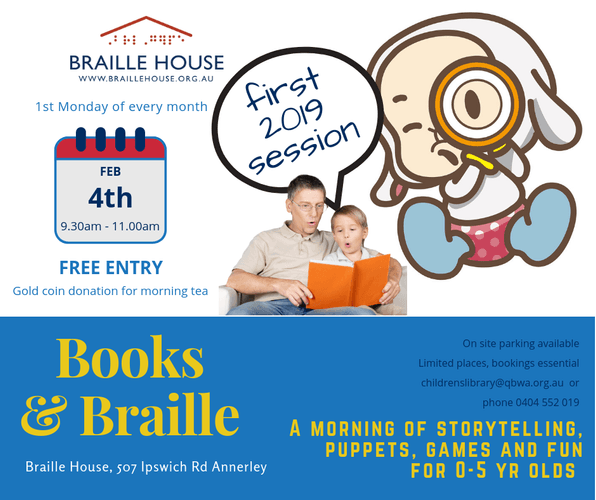 Free storytelling, games, puppets, craft and fun for 0–5year olds. Gold coin donation for morning Tea. On site parking available. We’re excited to launch the year in our upstairs air-conditioned room, where we can make as much noise and mess as we like! Join Spotty Dotty and friends celebrating 2019 the best way she knows how: with a book or 2! Followed by some messy crafty fun. To book, please email childrenslibrary@qbwa.org.au or phone 04 0455 2019. Can’t wait to see all our 2018 friends back, and looking forward to all our new 2019 friends! We welcome everyone between 0–5 yrs old and their parents/carers for a fun morning.